On the eve of the destruction of the Twelve Colonies by the Cylons, you could have looked down at those twelve colonies and seen worlds of diversity, people not just separated by distance, but by culture and tradition. The farmers of Aerilon experienced a far different life than those on the settled capital of Caprica City. Binding them all the belief they all descend from a single origin from the planet Kobol and their shared government in the Quorum of Twelve. Our city is a rich tapestry of humanity, full of diversity, challenges and fantastic wonder. From the best of our divination, it does not seem we stand on the precipice of armageddon and destruction at the hands of a cybernetic civilization (although you can never be too sure), but the analogy is a fun one and while the continued existence of our species may not be at risk in this election, the stakes of the issues facing our community are high – whether it be the City Centre Airport, a new hockey arena, improving our transportation system or encouraging a greater sense of community and belonging – this election is an vital chapter in our city’s political history. 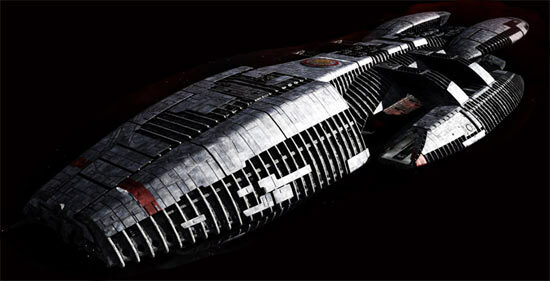 As you might have guessed, we are huge fans of Ronald Moore’s re-imagined series of Battlestar Galactica. If you have never seen it do yourself a favour and check out this great television series that shows humanity on the edge of a knife, facing extinction. People who originally hailed from one of twelve planets, but now live together collectively on the run from their enemies and looking for a new planet to call home. Scott and Adam have asked us to look at the political structure of this fictional world and see if there is enough to link our wards in this municipal election with their counterpart among the Twelve Colonies of Kobol. Let’s see what we can find on the Dradis. First up is Ward 1, in northwestern Edmonton. Home to West Edmonton Mall, Ward One is also the only ward with a navy, the presently out-of-service subs floating alongside the replica Santa Maria inside the mall. It sounds like a perfect stand in for Aquarion, a planet covered in seas. We couldn’t find a oceanic related policy amongst the politicians vying for a seat here, so if Andrew Knack, Jamie Post or incumbent Linda Sloan drop by your home seeking your vote, you may want to ask them if the virtually mothballed navy in West Edmonton Mall is prepared for an impending Cylon attack. Ward 2 is home the controversial Edmonton City Centre Airport, a perfect stand-in for the harbours of Picon. Kim Krushell is seeking her re-election in this ward but is facing competition from Don Koziak, Roxie Malone-Richards, Shelley Tupper and Michael Waddy. We are in no position to take the metaphor far enough to divine a position on the airport, but we do wonder if any of the candidates have a position on seeking a thirteenth ward, a ward rumoured to have been separated at the city’s founding 100 years ago. Ward 3 in northern Edmonton has no incumbent running, but a hotly contested seat with crime topping many residents’ list of concerns. 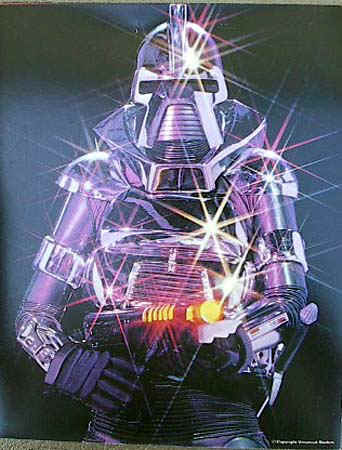 And there was no greater criminal prior to the Cylon invasion than Tom Zerek, originally from the colony of Sagittaron. Tom went on to a glorious career (sort of) in politics, becoming Vice-President of the colonies, a campaign manager and even leader of an unsuccessful coup. Not that we see that kind of naked ambition from the candidates in Ward 3, but a heavily contested election is certainly causing the candidates – Cassady, Demers, Fairbridge, Loken, Naboulsi, Oplanich, Silver, Sobolewski and Suess – to pound the pavement. Ward 4 is the ward we find nearest to nature and closest to our agriculture industry. In the northeast corner of Edmonton, en route to Fort Saskatchewan (as well as our monthly trips to Elk Island), what better place within our urban city to stand in for the breadbasket of the colonies, Aerilon. Present councillor Ed Gibbons is seeking re-election but is facing former MLA Dan Backs, Ken Atkinson, Hafsa Goma and Scott Robb. Fun trivia – Aerilon is where Dr. Gaius Baltar was born – but we could not determine if any of the five candidates could meet the standard of being the main antagonist of this election. Ward 5 is our ward – we live in the community of Thorncliffe – and in celebration of that we gave ourselves the honour of carrying the banner of Scorpia, the colony with… looser morals. This is the colony college kids head to for “Vernal Break.” If that does not describe our home, what does? Besides, we are just to the east of the new River Cree Casino, just as good a stand-in for loose morals. The flexibility of our moral structure should not necessarily be indicative of our politicians mind you, as we are choosing from Steve Begeron, Mark Grandish, Brian Kendrick and current councillor Karen Leibovici. 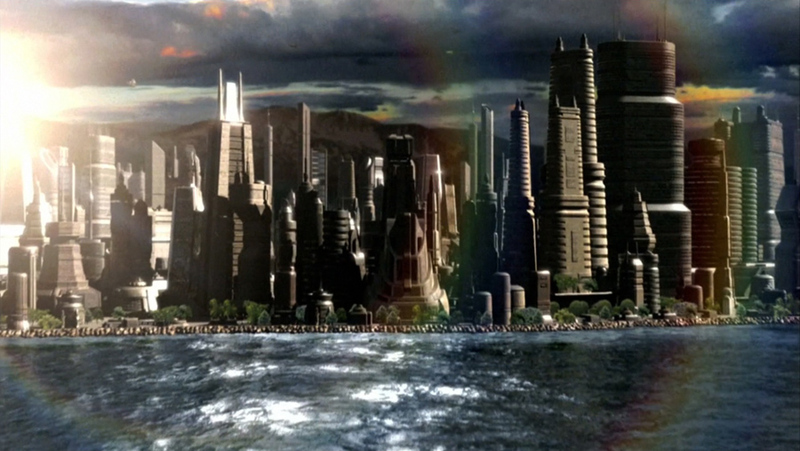 Ward 6 was perhaps the easiest to assign as the centre of government in Caprica. Home to both City Hall and the Provincial Legislature, Ward 6 is where all the political action is happening. Where the politicians fervently debate local issues – blind to the Cylon threat that could be in orbit right now. Eight people are running to represent this ward to council – Basualdo, Batty, Frost, Johnson, Kapitza, Permann, Pirbhai and Roberts. Ward 7 is home to Rexall Place. As avid hockey fans, we believe that sport is the ultimate judge of ability and skill. With courthouses, judges and lawyers, the colony of Libran is the centre of judgment within the twelve colonies and we’ve selected hockey to represent this cycle of justice. Besides, as a site of nuclear armageddon, Libran has something else in common with the previous season of the Edmonton Oilers. But from adversity springs hopeful opportunity and a bright future for our Oilers. As for who is competing to represent the Oilers (current) home you get to choose from sitting councillor Tony Caterina, former Journal scribe Scott McKeen, Grant Pullishy, Terry Rolls and Brendan Van Alstine. None of whom play Pyramid, but if they did that would guarantee we would move there just to vote for a genuine pyramid superstar. Ward 8 has the main campus of the University of Alberta within its boundaries – the centre of technology and research , not just of our city but one of the leading institutions in Canada. Virgon has a similar position among the twelve colonies as a centre of wealth and technological advancement. Here Ben Henderson, who is looking for a second term, is facing Duane Good Striker, Lori Jeffery-Heaney, Sheila Mckay and Hana Razga. Be sure to ask any of these candidates their feelings on technology and whether we might go too far in linking computers. Ask if we might one day face nuclear annihilation from linking these computers together. We believe it is good to keep candidates on their toes, plus you are guaranteed not to get a practiced sound byte in response to that question. Ward 9 is in the southwest corner of the city, graced on one side by the North Saskatchewan River. The two of us spend many hours on the riverbank walking our dog and enjoying the river valley. It sounds like the people of Canceron do something similar along their famous beaches. It does not seem Canceron has experienced the explosive growth Ward 9 has though – although other explosions have happened there. Bryan Anderson is seeking his fourth term in this ward, facing off against Rami Bader, Calvin Lim, and Jennifer Watts. Ward 10 has a giant farm right in the middle of it – the University of Alberta farm on South Campus. This might be home to much of Expo 2017 but for now it is a rolling, peaceful plain, much like the open plains of Leonis. You can also find much of the newly expanded south LRT system in this ward, along with past Unknown Studio guest Don Iveson, who is running for re-election against Al Slemko. Ward 11 is one of the wards without an incumbent running, as well it has some of Edmonton’s oldest neighbourhoods. Alongside older neighbourhoods comes older knowledge, traditions, wisdom. Gemenon has a similar role being a deeply religious colony, one where the traditions and teachings brought Chief Galen Tyrol the wisdom to help guide the Battlestar Galactica back on track when it looked like it was lost. Given the absence of an incumbent and the importance of the issues facing this ward, there is no lack of contenders – Shane Bergdahl, Kerry Diotte, Vishal Luthra, Roberto Maglalang, Chinwe Okelu and Brent Schaffrick are competing for votes on October 18. Ward 12, our last ward, is one with a rich cultural history that can be seen reflected in Tauron, home to the Adama family before they moved to Caprica. Proud of its cultural heritage, the people of Tauron were once known to tattoo their faces to display their identity and the adversity the individual had experienced. No word on whether Vikram Bagga, Gerry Horn, Chuck McKenna or sitting councillor Amarjeet Sohi would be willing to go that far for your vote, but that is no reason not to ask what they will do for you. The issues facing our own Quorum of Twelve, alongside the Mayor of Edmonton come October 18th are important so – as a couple who are almost as politically engaged as we are fans of the Battlestar Galactica universe – we urge you to find out about the candidates in your ward and cast an educated ballot on election day. The politicians in the twelve colonies had no idea that they would be looked to be leaders of their people following nuclear catastrophe but leaders like Laura Roslin did their best to take their people from the edge of annihilation and into the future – we humbly expect nothing less from our City Council should the Cylons strike. I have not seen the new BSG, but this was a fine post! And I even feel like I know something of the BSG world.